40 Muslim families who were allegedly held captives as human shields by the SLA have also sought refuge at the Technical College. Muslims from Pa'ndaarave'li, Musali and Koo'laangku'lam in Musali division complained that the SLA soldiers were harassing them accusing them of supporting the Tigers. They were allowed to reach the Don Bosco Technical College via Chilaavaththu'rai Murungkan Road. 99 families have sought refuge at the technical college. Police have told the IDPs that they would be free to move after inquiries on individuals are complete. Around 500 individuals of 133 families were registered as IDPs in Umanakari GS area in Naanaaddaan division. 129 persons of 29 families had reached Eruviddaan and 54 persons of 16 families were registered in Puththiraka'ndaan. 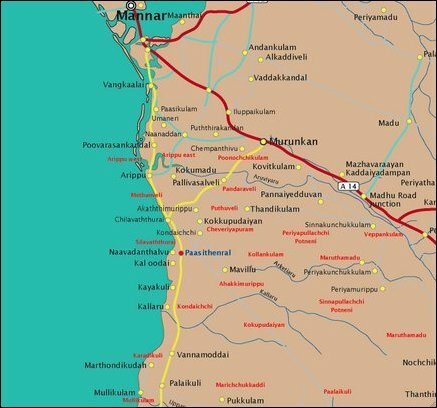 More than 4500 civilians have fled Musali division to public buildings and relatives in Naanaaddaan division in villages Pontheevukka'ndal, Vaazhkaip-paddaan, Pa'l'lakkamam, Razool Puthuve'li, Vangkaalai, Na'ruvizhik-ku'lam and other villages. Meanwhile, the Government of Sri Lanka (GoSL) in Colombo proclaimed a military victory in Musali division where Tigers were known to have maintained pockets of areas along the coastal belt. 5864 persons, among them 1644 Muslims, were registered residents in the division, according the statistics from the divisional secretariat in 2006.